My husband and I were just getting up to do our morning sadhana. It was 5:00 am when we got the text message. It was from our good friend Robin Layton who has done a lot of photography for us. 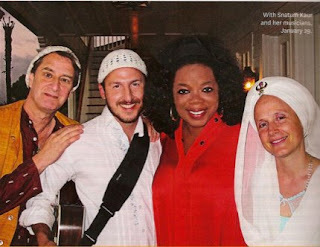 It read something like… “Maria, Oprah’s friend, would like to fly Snatam out to Maui for her birthday today. Call me right away!” Well, as it turned out we were in Maui! We were in fact about 20 minutes away from where Oprah was having a small birthday gathering that evening. My husband and I decided to do our sadhana first before calling to make all of the arrangements! Might as well make sure you’ve got your soul fully incorporated especially for days like these! By God’s Grace the gifted musicians Todd Boston and Daniel Paul accompanied me. We were driven up a beautiful country road, and as our driver approached Oprah’s residence he kept a keen eye out to make sure that Oprah did not spot us, as it was a surprise for her. At 5:45 pm we found ourselves on the second floor of Oprah’s house hiding in a room, and were asked to come down the porch steps to the veranda below when we heard a bell chime. I will never forget walking down the porch steps singing “Oh my Beloved, Kindness of the Heart” the introduction to “Ong Namo” with Todd playing guitar and Daniel carrying one tabla. I was so nervous, I could barely push the notes out, and at about five steps down Todd kind of stepped on my chuni (flowing veil). At the thought of the events that could have followed such a thing (including falling down the stairs while singing) I got a grip of the rail. Todd and I must of had the same vision because we both let out a nervous chuckle. I looked over at Daniel Paul who was playing a singular tabla and singing with this great big smile. I decided that if we had in fact plummeted down the steps he would still be smiling and in full glory. That’s Daniel. 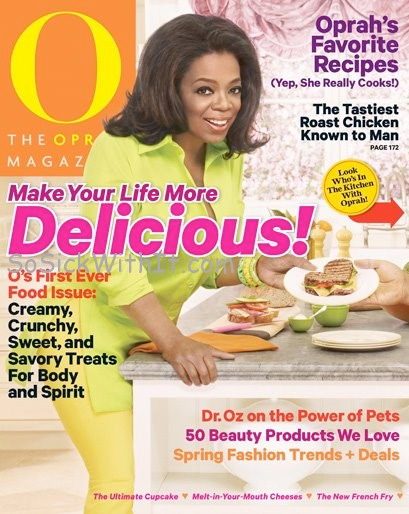 At the bottom step I was now fully singing and right there Oprah was sitting with tears in her eyes. That’s when I let go… that’s when I let God. 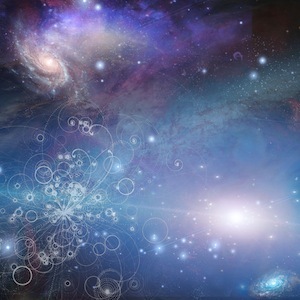 God is in everything, in everyone, God is in me, and God is in this moment. We proceeded to chant a few more pieces; “Guru Guru Waheguru” (Guru Ram Das – Healing), “Ra Ma Da Sa“, “By Thy Grace”, and “Kabir’s Song.” I felt really blessed to have Todd’s sweet guitar playing, and Daniel’s supportive tabla playing along with his spirited harmonies. In fact everyone was singing. Everyone was singing! I could have never imagined this. My gratitude to Thomas Barquee who produced this music with such care, meditation, and joy that it reached the ears of Oprah. My gratitude to my record label, Spirit Voyage, for supporting us all of these years. My gratitude to God because nothing happens without His Doing. It was beautiful and empowering to see this beautiful woman, who with obvious pressures and responsibility has kept her grace and is very down to earth. After finishing, Oprah came over and gave each one of us these incredible hugs. I will never forget her absolute warmth and radiance. True to Oprah’s gift, in a matter of seconds she managed to ask me a few questions and I suddenly found myself pouring my heart and soul out to her. As we gathered for a photo, and Todd was not in it, she called out, “hey Todd come over here!” Later that week we had a concert which she came to. I loved how she got my daughter to smile when she visited us back stage. She asked her, “Can I say hello to you?” My daughter shook her head no and looked down shyly. Then she said, “Can I say hello to your knees?” and proceeded to tickle her knees. Within a few more variations of this, like “your belly”, “your nose”, my daughter was smiling. It was a really sweet moment. This was an incredible experience for me. All I can say is…. just keep doing your thing. Do it with joy, with love, and faith because you never know who is listening. 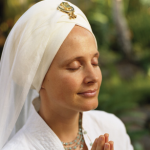 What Oprah Knows For Sure: Snatam Kaur is Amazing! Oh that was WONDERFUL to hear your side of that story I read about in O magazine this month!!! SO SO beautiful and I love the part with your daughter!! !